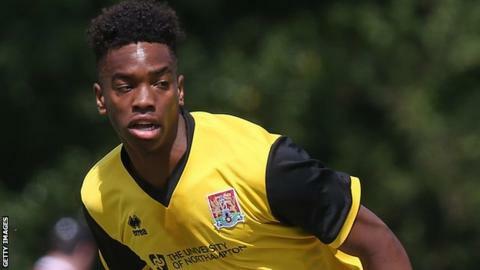 Northampton Town boss Chris Wilder says there has been interest from "Championship and Premier League clubs" in striker Ivan Toney. "There are quite a lot of things that have got to happen for a player to be transferred. "Everybody has to sort their own part of the deal out," Wilder told BBC Radio Northampton. "That'll progress in its time, and if it does then we'll deal with it." Toney has made 60 appearances for the League Two club, more than half of them as a substitute, but he became a regular in the side last season, scoring 10 goals in all competitions. "I can't speculate what's going to happen apart from the immediate speculation. I'll know more soon," said Wilder. Meanwhile, Cobblers chairman David Cardoza says he will shortly announce a potential completion date for the club's proposed takeover by an Indian consortium, though Wilder insists he is unaffected. "Until anything happens he's (Cardoza) the chairman of the football club, so he makes the decisions and we all work for him and we will continue doing that until I'm told otherwise," he added.